Tagged under Kotomi Aoki, Series. When Mayu Taneda was 8 years old, she used to visit the hospital to see her childhood friend Takuma Kakinouchi with a serious heart illness. Mayu, as a child, used to examine the little Takuma but it all ended with the two of them fighting childishly and them being sermoned by the hospital nurse. One time, Mayu overheard his father, who is also Takuma's doctor, say that Takuma will die soon. Mayu cried when she heard about it... she then asked Takuma to find a 4 leaf clover together with her believing in the saying that if you find it, your wish will be granted. Takuma asked Mayu what is she trying to wish for, but she lied and didn't tell him the truth. When they didn't find it... Mayu cried more. Takuma then said stop and kissed her. After the kiss, Takuma promised that when they grow up they will marry each other, specifically when they're 20 years... but knowing the consequences that Takuma might die earlier than 20, Mayu still believed Takuma's words and stayed by his side. What will happen to Takuma after 12 years? Will he marry Mayu or leave her because he's afraid to hurt her by dying? 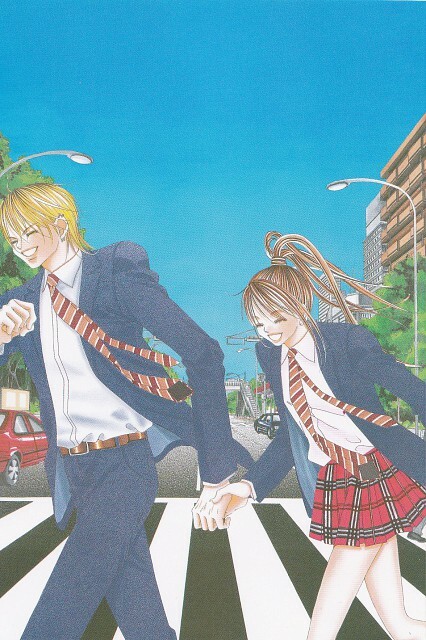 "I Give my First Love to You" is the 2nd most beautiful romantic manga i have ever seen in my life! It begins when Mayu and Takuma were children. They were friends since they were 8 years old. Takuma has a heart disease and he is treated by a cardiologist who happens to be Mayu's father. One day, Takuma and Mayu overhear that Takuma will not live past the age of 20 due to his condition. However, their friendship grows and Takuma becomes Mayu's first love. When they are out playing in the fields, Takuma promises to marry Mayu when they turn 20. To Takuma's surprise, Mayu managed to go into that school and had actually done well enough in the school's entrance examination that she became the 1st year student body representative XD (GIRL POWER)! Later, Takuma suffered a heart attack. He was rushed to hospital, and the doctor did not give him much chance of living. In his sleep, Takuma prayed that he could have just a short time more to live, and he got a miraculous recovery, and surprised Mayu. He brought Mayu on their "honeymoon", visiting many places. I JUST LOVE THAT CUPLE! KIA! DOKI DOKI! Really love this one, the art is really nice, and OMG the drama! It has so much of it that it will fill your drama meter for a month. Give it a try, the love story is really romantic and it has some delicious moments for them perverts too. the main characters got lots of challenges to overcome with.. i hope they'll be happy in the end.. i hope that the guy live longer.. longer with the girl.. the girl really loves him so much ever since they were a kid..
No feedback on Boku no Hatsukoi wo Kimi ni Sasagu.